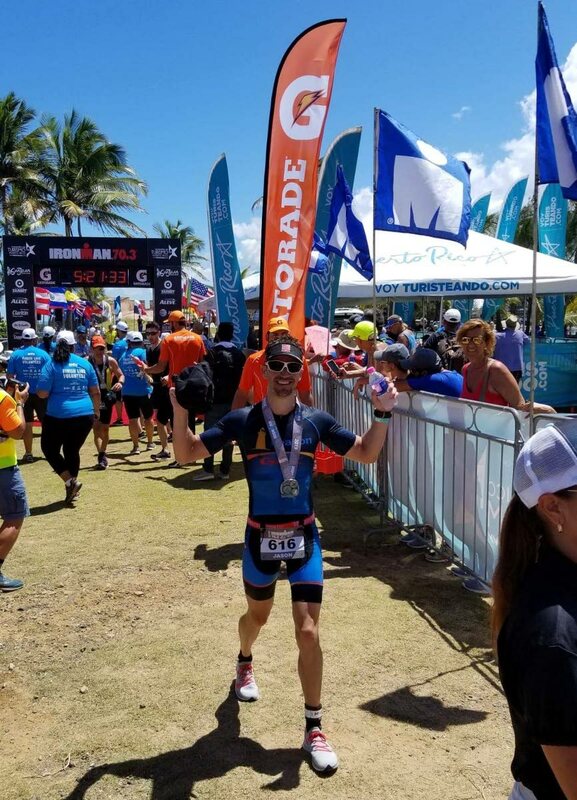 NATIONAL triathletes Jason Costelloe finished 12th in his 30-34 age group and 59th overall, while Gina Hart placed fifth in her division and 309th overall at the 2019 Ironman 70.3, a gruelling World Championship qualifying event, which was held in Puerto Rico, on Sunday. Costelloe, who also finished 55th among men, accumulated 3,154 points and clocked 4:52:16 at the finish line. He completed the swim in 33 minutes, 57 seconds, followed with the bike ride in 2:26:23 and closed the run in 1:46:37. Hart, competing in the women’s 50-54 age division, finished with 2,486 points, completing the swim in 42:12, clocked 02:53:46 on the bike ride and finished the run in 2:07:51 for a total time of 5:52:43. Almost 900 athletes from around the world, mostly from the Americas, completed for a place at the 2019 Ironman 70.3 World Championship. The 70.3 refers to the distance of the course, 70.3 miles, separated by a 1.2 mile swim, 55 mile bike ride and to a 13.1 mile run or half marathon. “(Despite being unable to qualify) I take every race as a learning experience so I can come back better and stronger than before,” Costelloe told Newsday after the race. Speaking on his performance, Costelloe said, “with the challenging hilly course and high temperatures I knew I had my work cut out for me. “I felt very good and relaxed from the swim and moved straight onto the bike portion. I quickly picked up the pace on the bike section and surged immediately ahead. At the first checkpoint into the ride at 19.3 miles, I clocked one of the fastest sector times and was already up into seventh place in my age group holding a pace of almost 38kph. Costelloe kept momentum for the majority of the ride and said he tried “to find my sweet spot and conserve some energy for the long run ahead. “Completing the 55 mile bike ride in a time of 2 hours, 26 minutes at an average pace of 37kph, I moved up nine positions and was sitting in seventh place in my age group. “I started my 13.1 mile run at 10.30am when the temperatures were really starting to rise. The run course comprised of a two loop around the San Juan capital which included some hills to make it a bit more challenging. Costelloe added that he held his pace and position for the first half of the run and into the three-quarter mark, only for things to take a sharp turn. “With three miles left on the run, my body was depleted and the heat was catching up to me. My pace slowed down and I had to dig very deep to find every last bit of energy needed to finish the race. “During this time, I was caught by a few fellow age groupers, but nonetheless crossed the finish line completing my 13.1 mile run in 1 hour, 46 minutes. Far from dissatisfied, Costelloe said he has other events planned to keep him busy, including the Caribbean Triathlon Age Group Championship in Miami in May, the National Triathlon Championship in June, the National Duathlon Championship in July and the National Road Time Trial in August. He said he also hoped to attend the Barbados International Triathlon Championship in October, the Grand Bahama International Triathlon in November, and the Caribbean Long Course Triathlon Championships in St Croix in December. Costelloe added, however, that can only attend most of the events by means of corporate and individual sponsorship. Reply to "Costelloe,Hart finish Ironman 70.3 in Puerto Rico"